The show in Poznan, Poland on 25 February, 2005, will be at the Blue Note and not the Browar. The Pink Dots have tentatively scheduled a show in Lund, Sweden on March 2, 2005 (more details to follow as they are confirmed). They are still seeking shows in East Germany or Northern Czech Republic on February 28 and/or March 1, 2005. Areas of interest in East Germany are Leipzig, Dresden, Chemnitz and possibilities in Northern CZ are Hradec Kralove, Olomouc. If anyone has any suggestions, contacts or tips for the aforementioned locations, please send me an e-mail or use the Contact Form on this website. The Pink Dots are looking for shows in East Germany or Czech Republic on February 28 or March 1. If anyone has any suggestions or venue contact information, please use the Contact Form on this website or send me an e-mail. Any and all tips will be welcomed! Just confirmed: The Legendary Pink Dots will perform in Tel Aviv, Israel on January 28 and January 29, 2005. At the Downloads page, you will find a great version of Black Zone, recorded in Burlington, VT in 1989. The Legendary Pink Dots will perform at Desmet Live (Human Radio) on February 22, 2005. Admission for approximately 40 people will be possible. More details will be posted soon. A show at Merleyn in Nijmegen has been added to the tour roster. The show will take place on February 16, 2005. A show in Milan, Italy at Transilvania has been added. The show will take place on November 28. The November 13 show in Debrecen (originally at Kasanthaz) has been moved to City Theatre of Debrecen (Csokonai Szinhaz Studio). Scroll down for a complete list of European tour dates. The Legendary Pink Dots have just added a show at Antidox in Torino, Italy to the roster. The show wil be on November 29 and Fabrizio Modonese Palumbo & Paul Beauchamp will open. The Pink Dots are still looking for contacts and tips for venues and more shows in Italy this month. If you can help, please e-mail me. Any and all information will be greatly appreciated. The show in Krakow, Poland on 5 November will be at Loch Ness instead of RE. Over at the Downloads page, you'll find an achingly beautiful version of The More It Changes recorded in Burlington, VT in 1989. Lovely! Shows in Wurzburg and The Netherlands have been added to the 2004 / 2005 European tour schedule. Scroll down for a complete list of dates. Due to unforeseen circumstances beyond the control of the band or the venue, The Pink Dots show scheduled for October 30th in Gdansk has been canceled by the promoter. The Pink Dots extend their apologies and hope to return to Gdansk as soon as possible. The Pink Dots have confirmed their show in Ostrava for November 15th. The show will take place at Marley. Scroll down for a list of all confirmed dates for 2004/2005 and please keep checking this page for updates. A show at Waschhaus in Potsdam has just been confirmed. This show will take place on February 24, 2005. Scroll down to see all confirmed dates for 2004/2005. The show in Arhus on October 20th has been moved from Train to Musickafeen. Here is the current European tour schedule for The Legendary Pink Dots. More shows are being added and confirmed, so keep checking this space for updates. The Legendary Pink Dots have just confirmed a show at Cafe Central in Weinheim on December 8th. Scroll down for a complete list of European tour dates. Niels Van Hoorn and Richard van Kruysdijk (of Sonar Lodge) are pleased to announce their first release under the name Strange Attractor. Entitled Rorschach, the album will be officially released November 18 on the Music for Speakers label. Legendary Pink Dots fans will be able to purchase the album at the merchandise stand on the European tour prior to the release date. From the label press release: "Out of a warm, acoustic jazz atmosphere springs forth a cold, sequenced synth pattern. �Full throttle� acoustic drums and harsh double sax frenzy turns into minimal glitches. Hip-hop style raw beats are underlined with eerie, floating acousmatic soundscapes. Touching the edges of jazz, ambient and electronica, Strange Attractor's debut LP is a high-spirited exercise in associative music-making. Rorschach gives insight in how tracks evolve through different approaches of sound, while retaining a constant emotional depth and consistent, intense undercurrent. Although often placed in a moody, melancholic musical setting, it is the result of a joyful, inspired collaboration between Niels van Hoorn (The Legendary Pink Dots) and M4S resident Richard van Kruysdijk (Sonar Lodge). Guest appearances by vocalists Edward Ka-Spel (The Legendary Pink Dots) and Marie-Claudine Vanvlemen (Sonar Lodge) add even more colour to the rich sound palette of this vinyl-only release." You can listen to the album in RealAudio here and you can view the entire .pdf press release here. The download for the month of October is Third Secret recorded in Salt Lake City, UT on July 1, 2004. If any of you have been having trouble with the latest downloads, the files have been re-uploaded and should be working fine now. If you are still having problems, please e-mail me. Here is the current European tour schedule. More shows are being confirmed so keep checking this page. I will post shows as they are added/confirmed, so please keep checking this website for details. Featuring: Edward Ka-Spel: "15 Minutes of Sorrow" - an edition of one cassette album release with a lament dedicated to the format itself. Music is exclusive to the artpiece. There will also be a limited gallery 10" acetate with new tracks from Edward Ka-Spel and many other BLRR artists. Come one, come all! The Helsinki show at Taviasti-Semifinal on 26th October has been officially confirmed as well. Please note that date and venue changes are likely, so keep checking this page for details. Also, friends and fans with contacts that can help us "fill the gaps" in the current roster can use the contact form at this site or e-mail me with tips and / or information. We appreciate all the help! The Legendary Pink Dots are in the process of confirming dates for their European tour. Previously, we had announced that the tour would begin in Cologne on October 13, but now it is slated to kick off on October 20 in Arhus. The show in Cologne will take place later in the tour. We will post updates as shows are confirmed, so keep checking the website for details. The Dots are looking for contacts in Sweden (preferably Gothenburg - preferred date is October 22). Please use the contact form at this website or send me an e-mail if you can help. The obligatory disclaimer: Dates and venues can still change. The 2 X LP version of All The King's Men has been released by ROIR. Though there is no bonus material on this album, it will still make a spiffy addition to your LPD collection. The cover art is exactly the same as the CD release, only "bigger and more beautiful." Though the album may not be listed on the ROIR website just yet, rest assured it is indeed available for purchase. Beta-lactam Ring tells me that the 2 X LP version of Edward's Pieces of 8 will start shipping on or around September 1. The LP features a bonus track called Wall of Fire as well as a poster and a signed and numbered insert. This release is limited to 333 copies. We are pleased to announce that the Brainwashed Eye: Volume 834 is now available for sale through Brainwashed Commerce. Arranged and filmed by Jon Whitney, The Eye: Volume 834 includes interviews and concert footage from Edward Ka-Spel's solo show (September 2003) and The Legendary Pink Dots concert (June 2004) at The Middle East in Boston, MA. To see part of the videos, you can go here. Both videos have been slightly updated/modified to include footage not featured in the online versions. This volume is being sold for $15 (before shipping) and is only available here. The Legendary Pink Dots are preparing for their European tour which is slated to begin on October 13 at the Underground in Cologne. The Pink Dots also hope to play their first-ever shows in Finland, Latvia, Greece, Slovania and Estonia this year. Edward has asked that fans with tips for clubs in the south of France or Slovania contact the band with information. You can use the contact form at this site or send an e-mail to me. Also, the vinyl release of ROIR's All The King's Men is imminent (release date is August 24). You can view the one-sheet here. The Legendary Pink Dots will be appearing at Red Club in St. Petersburg, Russia on September 18. I will post more details as they are confirmed. The Legendary Pink Dots will perform on San Juan Island on August 14 at Egg Lake Music Faire (Friday Harbor, WA). Those attending should e-mail egglake (AT) rockisland (DOT) com for details and to be added to the invitation list - required by the State of Washington Liqour Board. At our Downloads page, you will find a live version of one of the more popular new tracks The Equaliser. This version was recorded in Washington, DC on June 3, 2004. The Legendary Pink Dots will open for Skinny Puppy in Amsterdam at the Paradiso on 13th July!!!!!! The Atlanta show at Echo Lounge was cancelled due to unforeseen circumstances outside of everybody's control. Both the band and the Echo Lounge want to extend their apologies to everybody who came out for the show but were unfortunately turned away. LPD want to especially thank everybody who stuck around and bought merch from the group on the street. At this point, if there are still people who are in need of a refund, they need to conact the Echo Lounge at 404-681-3600. LPD are doing well and are sad they didn't get to play, Atlanta's always been a supportive town and LPD will definitely return there next tour. We are very, very excited about the North American tour! Lots of great buzz is circulating - we've scheduled lots of interviews for national and local print media and - dare I say it - The Whispering Wall is even seeing some airplay on several radio stations around the country! We'll also be broadcasting our June 23 show at Cafe du Nord live as it's happening - so keep your ears peeled! It's going to be a great tour and we are all looking forward to seeing all of you at the shows! Make sure to come and say hello to me at the merch booths. If you take photos at the shows, we would really appreciate it if you would send copies to me at the address noted above. 300 dpi resolution photos of the band are ALWAYS requested and we ensure that full credit is given to the photographer if the photos are used on album releases or in print media. A side note: PLEASE DO NOT E-MAIL ME ANY PHOTOGRAPHS UNTIL I RETURN FROM THE ROAD. My e-mail access will be very limited until mid-July. So - until soon...off we go! Over at the Downloads page, you'll find a live version of Soft Toy, which is the opening track on the new CD The Whispering Wall - many thanks to Erik Gibbels. Soft Toy was recorded in Liege on April 14, 2004. Denver-based Orbit Service has been invited to open for The Legendary Pink Dots in Denver on July 2. Orbit Service also opened the show last year when Edward Ka-Spel's solo tour made its way through Colorado. Welcome back, guys! LPD fans in Pittsburgh take heart! We've been able to add a date at The Brew House Art Space (2100 Mary Street - 412-381-7767) on May 25th! We're glad this one worked out as we were feeling a bit sad about not visiting PA on this romp through the US. We'd also like to welcome A Tiger Named Lovesick to our bill in Dallas, TX and Glow to our bill in Sauget, IL! We're very excited to announce that Rasputina will once again be coming on board at the State Theatre in St. Petersburg on the 10th of June! We have also added Whitelodge to our bill in Atlanta on June 11th. We'll have plenty of these at the merch stands in North America for sure, but if you simply can't wait to get your hands on one of these gorgeous new t-shirts, you can pre-order them through TeKa now! We're pleased to announce that Big City Orchestra will be opening the shows at Cafe du Nord on June 23 and 24th. LPD and BCO have collaborated on several different projects throughout the years so we're looking forward to these dates! 04/28/04: WHISPERING WALL LISTENING PARTIES IN FLORIDA! There will be two Whispering Wall listening parties in Florida next month! They'll be giving away tickets to the June 8 LPD show at The Culture Room in Ft. Lauderdale and ROIR will supply all sorts of fun stuff, so don't miss out! Indie/ElectroSmash/80's/BritPop/NewWave "...A refreshing change from the all too familiar corporate radio, cheesy club, and annoying MTV fodder that currently pollutes the entire freakin' world." 04/27/04: PIETER SCHOOLWERTH - PINK DOTS FAN, ARTIST, ... DJ? Those of you attending the LPD Tour Party at The Lucky Cat in Brooklyn on May 12th are in for a treat! Artist extraordinaire Pieter Schoolwerth will be spinning tunes along with DJ Princess Coldheart. You'll remember Pieter for the brilliant cover art gracing the cover of the 090301 CD-single from the Love and Loud Colours lyric book. Remember, they'll be giving away free copies of the new Legendary Pink Dots album The Whispering Wall, so don't miss out! 04/25/04: STREET-LEVEL PROMOTIONS - FULL SPEED AHEAD! When you're taking a break from perusing TeKa and pre-ordering all those beautiful new releases, you may want to head over to the Street Team page to find out how you can help promote the rapidly-approaching North American tour. Any help is greatly appreciated! I've outlined some basic suggestions for you, but please always feel free to think outside the box. If you have a great idea for additional promotions, get in touch! You'll also find a new link on our purple sidebar at the left-hand side of your screen that will take you straight to the tour dates. No more scrolling through pages and pages of text to make sure you've got the most current information. Just use the handy link! 04/24/04: NEW RELEASES AVAILABLE FOR PRE-ORDER AT TEKA NOW! A plethora of new releases is now available for pre-order through TeKa. 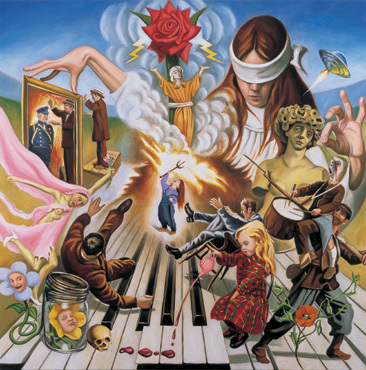 Click on the big magenta letters on the main page and you'll be able to place your orders for The Whispering Wall, Pieces of 8, The Poppy Variations, and yet another release entitled Crushed Momentos, which is described by Chez Dots as "Ridiculously rare pieces from the early 80s presented on CD for the first time. Not so lo-fi anymore as Raymond painstakingly remastered this delightful dance around the People Tree." 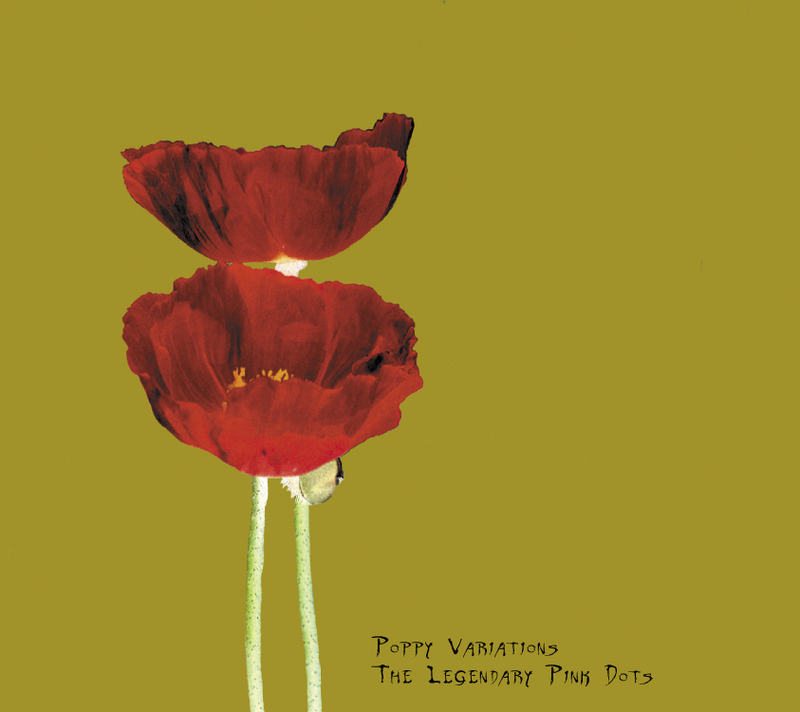 TeKa is also taking pre-orders for Legendary Pink Dots t-shirts and buttons this time around! We'll also have buttons galore at the LPD merch booths along the course of the North American tour (Thanks to the kind folks at ROIR). More updates to follow this weekend, including the long-awaited "Street Team" page, so keep checking back! DJs Princess Coldheart and The Narwhal will spin a variety of LPD and LPD side projects. There will also be drawings for free copies of the new Legendary Pink Dots CD The Whispering Wall and other goodies! Remember: The Pink Dots perform at BB Kings on June 2 so get your tickets soon! LPD will be playing several tracks from The Whispering Wall on the 2004 tour, so you don't want to miss your chance to win a free copy! 04/13/04: ANOTHER NEW LPD ALBUM IN THE WORKS! Newest CD release from Terminal Kaleidoscope licensed to Beta-lactam Ring Records for the Americas. Details, MP3 samples and art coming soon. A vinyl edition will occur late Summer 2004 with a bonus 4th side and remixed songs from the CD. I'll post more details as and when, so keep checking this space! 04/12/04: MP3s FROM THE WHISPERING WALL ONLINE NOW - NEW TOUR DATES CONFIRMED TOO! 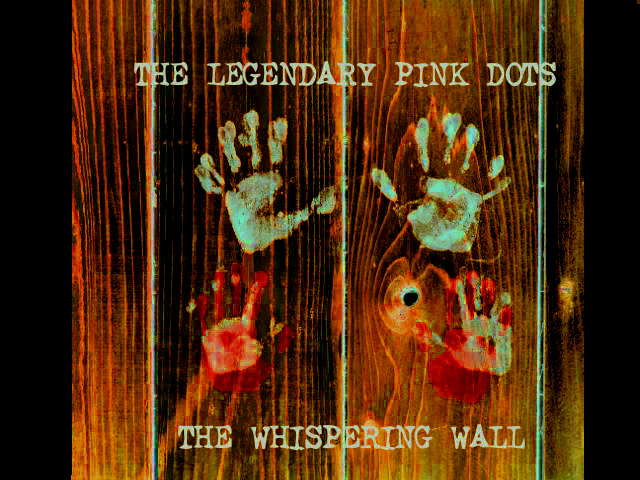 NEW MP3s: Head over to the Downloads page for MP3 snippets from every track on the new Pink Dots album The Whispering Wall, which will be released by ROIR on May 18, 2004 - two days before our first show! We have just added dates in Washington DC, Austin, Tulsa, San Diego, and Chapel Hill to our tour schedule! 7/02: Denver, CO - Bluebird ONE NIGHT ONLY!!! LPD fans in Albuquerque, New Mexico will be thrilled to know that there is no need for them to make that long drive to Denver this spring! For the first time ever, The Legendary Pink Dots will perform in Albuquerque at the Launch Pad on Saturday June 19th! We are very excited and look forward to seeing you there! Question: My band wants to open for The Legendary Pink Dots when they play in my city. Who should I contact? Answer: Please contact Lisa. I forward all of your requests to the individual promoters in each city. It is their prerogative whether or not local bands open for national/international touring acts. If a promoter wishes to put you on the bill with The Legendary Pink Dots, either they or I will be back in touch as soon as possible. EDITED TO ADD: Sending your request directly to our booking agent will only result in our booking agent immediately e-mailing the request right back to me so I can discuss it with the promoters. Therefore, we ask that you do not contact our booking agent directly. FURTHER EDITED TO ADD: Please do not send multiple e-mail requests to me. I have already stated if a promoter is interested in putting you on the bill, someone will be in touch with you as soon as possible. By sending multiple requests, you will only succeed in slowing me down further and making it that much more difficult for me to find your message in the ocean of e-mail churning away in my mailbox. I do appreciate your enthusiasm and The Pink Dots appreciate it too, but please keep in mind that multiple posts are completely counter-productive for the reasons stated above. 04/05/04: MORE UPDATES - FULL SPEED AHEAD! RASPUTINA JOINS LPD IN ORLANDO: In big, big, BIG news, I can now announce that Rasputina will join us on the bill at our gig in Orlando on June 9th! TOUR UPDATE: We have just confirmed our show in Salt Lake City on July 1st. An updated tour schedule appears below. We're still wrapping up shows in Washington DC, Albuquerque, Austin, Pittsburgh, and Tulsa. THANK YOU RYAN! Former Pink Dot Ryan Moore has been helping me out these days by taking photos of the new band line-up. I believe the last promo photos we saw of the Pink Dots were taken during the Malachai era, so his efforts are greatly appreciated. Otherwise, Ryan's been doing well in his endeavours with Twilight Circus Dub Sound System and he is now an official label-mate of LPD - via ROIR. You can read all about his latest release, due out April 20, by clicking here. AND OF COURSE: Here is the most recent tour schedule! TOUR NEWS: The spring tour is about 95% confirmed. Our booking agent is working diligently to nail down the remaining shows as I type. We have just confirmed our dates in Denver, Ft. Lauderdale, and Phoenix. An updated tour schedule appears at the bottom of today's marathon missive. Note that this will be the first time The Legendary Pink Dots have played only one night in Denver since 1995. It's an all-ages show, it's the last night of the tour and it's one night only, so BRING EVERYBODY! EDWARD KA-SPEL SOLO ALBUM MP3s: In other exciting news, Edward Ka-Spel's solo album Pieces of 8 - yes, yes, I know - we all thought it was called Pieces of Infinity too, but upon closer inspection of recent e-mails from Edward, both Beta-lactam Ring and I slapped our respective foreheads and withdrew our previous enthusiastic announcements. Anyway, it is indeed called Pieces of 8 though to be fair, the "8" really is laying on its side and looks just like an infinity symbol! Ah well...the important thing here is that we have MP3 samples from each and every track on the CD. To hear them, simply head to the Downloads page and click the links. BLRR strongly encourages people to pre-order this release from their website as the buzz is already spreading and copies are going fast! You don't want to miss out, do you? For those plucky souls who can handle even more excitement, here is the tracklist (though the order may be re-arranged prior to the album's release, sayeth ROIR) to wet your whistles. We promise to get you some little soundbites as soon as we can! TOUR FAQs: If you haven't already done so, please take a few moments to read through the FAQs pertaining to the North American tour. I would really appreciate it. STREET-LEVEL PROMOTIONS: Those of you who want to know how you can help promote the upcoming tour, please keep checking this space. As soon as my head stops spinning from this whirlwind of updating, I will be uploading a little page I built for the website where you will be able to download and print out fliers and find the information you are so desperately seeking! I've got loads of ideas for you if you can keep up! UPDATED TOUR SCHEDULE: And finally, here is that updated North American tour schedule I promised above! In an effort to preserve my sanity (and to make sure everyone who e-mails me with the following questions has a proper response), I am posting the answers to the most common questions popping up in my mailbox these days. Please read them carefully. If you have any further questions, please contact Lisa. Question: I would like to videotape The Pink Dots show in my city. Who should I contact? Answer: We will not allow video recordings. If you are a television station and would like to film the band, please contact Lisa. Otherwise, please do not bring any video recording equipment to the venue. Question: I would like to make an audio recording of the concert. Is this okay? Answer: We have no objections to audience recordings being made from small, unobtrusive hand-held devices. We will not allow you access to the sound board/F.O.H. console. We will not allow you to host your recordings on your personal website or server and we ask that you do not offer them for download on P2P networks such as (but not limited to) soulseek, grokster or kazaa. It goes without saying that placing the recordings on E-bay will not impress us. Private trades between friends, fans and collectors are perfectly fine so as long as no money changes hands. Please do note that if a specific venue has a strict no-recording policy, we cannot and will not intervene if you are asked by venue staff to stop recording or if you are denied access to the venue due to your audio equipment. All of that said, we do like to offer live tracks for download here at the website. If you are able to get a nice audio recording and will be so kind as to send me a copy, I will greatly appreciate it. Question: Can I take pictures of the band while they are performing? Answer: Still photography is permitted. Please try to refrain from using a flash whenever possible as flash photography can be distracting to the band and other members of the audience. As noted above, if a specific venue has a strict no-photography policy, we cannot and will not intervene if you are asked by venue staff to stop taking photographs or if you are denied access to the venue because you have a camera. If you are a journalist and will be photographing the band for an article or review, we do appreciate copies of the photos to use for our own promotional purposes. Full credit will be given to the photographer every time we use a photo.If you are interested in photographing the band for a magazine review, please contact Lisa. Question: I am under 21, but the show you are playing in my city is 21+. Can you get me in? Answer: Unfortunately, no. If the venue itself wants to make arrangements for you to attend a show, it is their prerogative and it's fine with us...but the band, tour manager/merchandiser, and sound engineer cannot intervene on your behalf. We do understand and appreciate that not all of our fans are over the age of 21, but we have no control whatsoever over specific venue age restrictions. Answer: Please contact Lisa. I forward all of your requests to the individual promoters in each city. It is their prerogative whether or not local bands open for national/international touring acts. If a promoter wishes to put you on the bill with The Legendary Pink Dots, either they or I will be back in touch as soon as possible. EDITED TO ADD: Sending your request directly to our booking agent will only result in our booking agent immediately e-mailing the request right back to me so I can discuss it with the promoters. Therefore, we ask that you do not contact the booking agent directly. Question: I see you have booked a date at "X" venue in "X" city. I think my club/venue would be a better match for The Pink Dots. Who can I contact to see if you will move the show to my club/venue? Answer: Thank you for your interest and enthusiasm. We do appreciate your desire to book The Pink Dots. If you are really and truly interested in booking LPD at your venue, however, PLEASE do not wait until we have already started to announce tour dates. Send Lisa a list of your club specs, contact information, sound capabilities, and the names, e-mail addresses and phone numbers for club promoters/club management. I forward all of this information directly to our booking agent so it is readily available to him when he begins routing a tour. You would be amazed at how many people I never, ever hear from again when I ask them for this information! CD edition: First 1000 packaged in a full color 8-panel digipack. Limited edition CD: Packaged in a metal case with a textured white enamel coating and silkscreened lid. Also included will be several photo inserts and a sticker. Limited to 75 copies. 2 x LP edition: 180 gram audiophile vinyl with a bonus 4th side of music, gatefold sleeve and special signed, numbered insert and mystery item. Limited to 333 copies. We do expect to have this release in time for the North American tour this spring! For details, keep checking this page or go to Beta-lactam Ring's website. It is with regret that the Legendary Pink Dots and Edward Ka-Spel feel that is now necessary to make it public that we have severed all ties with World Serpent Distribution. World Serpent last accounted to the band over a year ago, and made one partial payment under duress last August. While we appreciate that everybody involved in "independent" music is experiencing difficulties in a financially unstable climate, World Serpent's failure to answer even the politest question is simply unforgivable. Plans are already underway for the reissue of Chemical Playschool Volumes 8/9, with the other two titles on the World Serpent roster to follow later this year. We have just confirmed our show in Minneapolis, MN. Scroll down to see the most current tour schedule. Just in from Chez Dots: The new Legendary Pink Dots album (due this spring just in time for the North American tour) is called The Whispering Wall. It will be released by ROIR, who brought you All The King's Men in 2002. More details are expected shortly. In other news, I have also received the tracklist for the new Edward Ka-Spel solo album from Beta-lactam Ring. The album (entitled Pieces of ∞) will be released both on CD and 2 X LP. The 2 X LP will be limited to 333 copies and the CD version will be unlimited. The 2 X LP will also feature a track called Wall Of Fire. Here is the updated tour schedule. We have many more dates to confirm, so please check this page often. We have just confirmed our show in New York City. Please see the updated schedule below. We have just confirmed dates in Detroit and Boston. Please see the updated schedule below. We have just confirmed the first few dates for The Legendary Pink Dots' North American tour. The obligatory disclaimer applies as always - dates and venues can still change. Beta-lactam Ring is issuing a new Edward Ka-Spel solo album on May 18, 2004. The album is titled Pieces of ∞ (Pieces of Eight) and its release will coincide with the Legendary Pink Dots' North American tour, which is slated to begin on May 20. The album is described as "The third part in the Caste O' Graye Skreeens/O'er A Shalabast'r Tyde Strolt Ay series." Kansas City, St. Louis, Chicago, Cleveland, Detroit, Boston, New York City, Charlotte, Ft. Lauderdale, Tampa, Atlanta, Houston, San Antonio, Austin, Phoenix, San Diego, Los Angeles, San Francisco, Portland, Seattle, Denver. Don't panic if you don't see your city mentioned in the list above. There are plenty more shows to confirm right behind the ones I've mentioned here. This is merely the list of shows I expect will be finalized/confirmed within the next few days. The Legendary Pink Dots are finalizing details for at least two shows in Europe this April. More information on the European dates will be posted here soon. We are also sewing up the schedule for the massive North American tour this spring. Expect the first few confirmed U.S. and Canadian dates to be announced here shortly. The new Big City Orchestra release, Trixxy Pixxy, is now available as a free download! Featured musicians include Phil Knight (The Silverman), Daevid Allen (Gong and University of Errors), and the amazing Ninah Pixie. Those of you who were lucky enough to attend Edward Ka-Spel's solo show at Cafe du Nord in San Francisco last year will remember Ninah for her musical prowess with a dancing flowerpot. Click here to download the album and jewel case artwork. You'll find live versions of Evolution and The Brightest Star from Salt Lake City (November 2002) on the Downloads page. Keeping the pace with the buzz already generating since we announced tentative plans for the Pink Dots' return to North America for an extensive tour this spring, 9 Lives To Wonder, the newest LPD-related offering from Canadian-based label Flesh Eating Ants, is entering wider distribution. You can now order this release from The Terminal Kaleidoscope, Soleilmoon, Beta-lactam Ring Records, and of course the Ants themselves. Label Press Release: When The Legendary Pink Dots first unveiled their euphonious album 9 Lives To Wonder in 1994, few could have foreseen that this journey into the softer side of the band's psyche would withstand the test of time to become what is one of the best-loved and highly-regarded works in their prolific history. 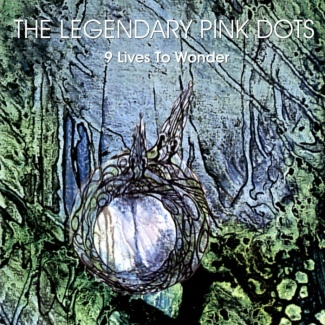 Like many of their releases from this time period, 9 Lives To Wonder aggressively explores the darker and more melancholy side of the Pink Dots, but it is also renowned for its strikingly romantic undertones and some of vocalist Edward Ka-Spel's most whimsical lyrics to date. Though many CD editions of this recording exist, Flesh Eating Ants Records is extremely proud to present 9 Lives To Wonder on vinyl for the very first time. In typical Flesh Eating Ants fashion, nothing has been held back. 9 Lives To Wonder has been issued as a 220-gram double LP, pressed on magnificently coloured audiophile vinyl, and housed in a stunning full-colour gatefold sleeve featuring the original cover artwork in a much larger magnitude, which showcases the beauty of the original piece. The album also includes an insert with lyrics, and is limited to just 404 hand-numbered copies. Some of the pieces have been slightly re-worked by Edward Ka-Spel, who has carefully layered and optimized the original musical textures and interludes to maximize the listening experience. 9 Lives To Wonder also includes an entire side's worth of exclusive bonus material and a new version of a beloved classic. So sink into soft nether worlds of enthrallingly kaleidoscopic melodies, transcendental ponderings, and wistfully languishing balladry as you absorb the album's underlying messages of peace, optimism and hope. 01/23/04: LEGENDARY PINK NEWS: BIRTHDAY WISHES AND A NEW ALBUM IN THE WORKS! Today, The Legendary Pink Dots are taking a break from their busy recording schedule to celebrate Edward Ka-Spel's birthday! Happy Birthday, Edward! Fans will be pleased to know that the band is currently recording a brand new studio album, which is expected sometime this spring. We are also in the earliest, earliest, earliest planning stages of the North American tour, which will follow the release of the new album. Keep checking this space for details! 01/18/04: JUST RELEASED: CD VERSION OF "EL KALEIDOSCOPIO TERMINAL"
Click here to order from Soleilmoon. The January 12 edition of The Brainwashed Eye, a video feature of The Brainwashed Brain, will feature three full songs from Edward Ka-Spel's solo show at The Middle East Club in Cambridge, MA on September 28, 2003 as filmed by our long-time friend Jon Whitney. You will also be able see two short interview segments from the same evening. The Brainwashed Brain is a weekly digest put together by the staff of brainwashed.com. New issues are posted online every Monday morning. To see the videos and interviews, click here and scroll down. Enjoy! The Legendary Pink Dots' recent show (November 2, 2003) at Pressure Point in Brighton, UK will be broadcast this Tuesday (January 6, 2004) on the Kosmische Club radio show on Resonance 104.4 FM in London. To listen in streaming Real Audio or MP3, click here. The show will be broadcast from 10:00 p.m. - 11:30 p.m. GMT and will feature snippets from an interview with Edward Ka-Spel. I'm told there will possibly be some giveaways as well. Happy listening! NEW MP3: There is a new MP3 online at the Downloads page. We're kicking off the new year with "When I'm With You," which was recorded in Milwaukee, WI on October 29, 2002. Look for more updates soon!